UNIVERSITIES pride themselves on it; the country spends millions funding it; and society as a whole can benefit from it. But does academic research really have the wholly positive impact on students that we're led to believe? Last semester students and academics alike reacted virulently to the faced closure of the University's Sociology department; a closure which was prompted by a poor Research Assessment Exercise (RAE) score. Despite being placed 4th in the Guardian University guide, which doesn't take into account quality of research, the department's poor RAE score provided significant enough concern to put its continuation in jeopardy. So, though clearly valued by universities, is research – omitted by one of the most prominent guides to university –actually that valuable to students? The most obvious benefit of a department's research is that it will probably rub off on the degrees they teach. Who better to teach a module on Modernist literature, for example, than a leading critic in that field? But it's not quite that simple. The University of Birmingham's Physics department is world-leading in some aspects of its research; however, due to its advanced nature there's very little scope for this to feed into undergraduate degrees. Moreover, in many Arts degrees, with minimal contact time and much onus on the student to carry out independent study, it's difficult to see how directly departmental research can really influence the learning of its students. This doesn't quite cover it though, because there are a number of indirect benefits too. The high esteem and prestige that a research-led university attracts can impact significantly on the value of their degrees, aggrandising what might sometimes be quite an average degree course. The most noticeable effect of this is how so many employers prize Oxbridge degrees over degrees from less prestigious institutions, ignorant of the fact that many degree courses from non-Oxbridge institutions often score higher in subject-specific league tables. On top of this, having good researchers in a department, especially those at the top of their field, can attract aspiring PhD students who regularly become the next wave of quality lecturers and researchers. But are these indirect benefits really enough? Surely there's no guarantee that, just because you have a more prestigious degree, you have vastly superior skills and intelligence to those from less esteemed institutions. And there is no assurance that the next wave of lecturers is going to be any good at teaching because the skills required to be a good teacher are hugely different to those required of a good researcher. It can't even be taken for granted that the best current lecturers are the best teachers. Vice President for Education and Access, Brigid Jones, believes that: 'there is a funding paradox in higher education, which is that a lot of money comes in from research to fund the best researchers and the incentive is to keep them for this reason, but the best researchers are not necessarily the best teachers.' As in the case of the recent Sociology furore, research predominates over teaching; the financial impact of research or lack thereof, outweighs the requirement for quality teaching. So, as well as being close to inert in its positive effect on students, does academic research in fact pose an active threat to our learning? A lecturer from the College of Social Sciences, who did not wish to be named, expressed the concern that, 'coupled with the incentive of promotion, the financial incentive both to the individual and to the University to prioritise research over teaching can negatively affect teaching quality.' However, the Head of the Political Science and International Studies Department, Professor Colin Thain, disagrees. He asserts that 'our students would not have access to such up-to-date teaching if Birmingham wasn't research led, but there are huge pressures to maintain teaching quality when resources have not increased proportionally.' Thus it seems that this tension between research and teaching are due to an insufficient level of funding and unfortunately it is research which is more readily and more lucratively rewarded. Is this a huge issue though? Anyone who cares enough will appreciate (and probably resent) the fact that universities are businesses and, as pessimistic as it sounds, businesses, and the markets they operate in, seldom function perfectly – look at the state of the world economy if you want some proof. Does academic research have a wholly positive impact on students? No, almost certainly not. And moreover, is it to the detriment of education that academic research is so important to many institutions? I guess that's debatable. But, to employ the use of a complex aphorism I learnt here at university, the proof is in the pudding. We're back where we started; the Guardian University guide, which omits research quality from its overall evaluation, this year placed the University of Birmingham 24th in the country, whereas in the Times Good University guide, which includes research quality in its evaluation, we're placed 22nd. 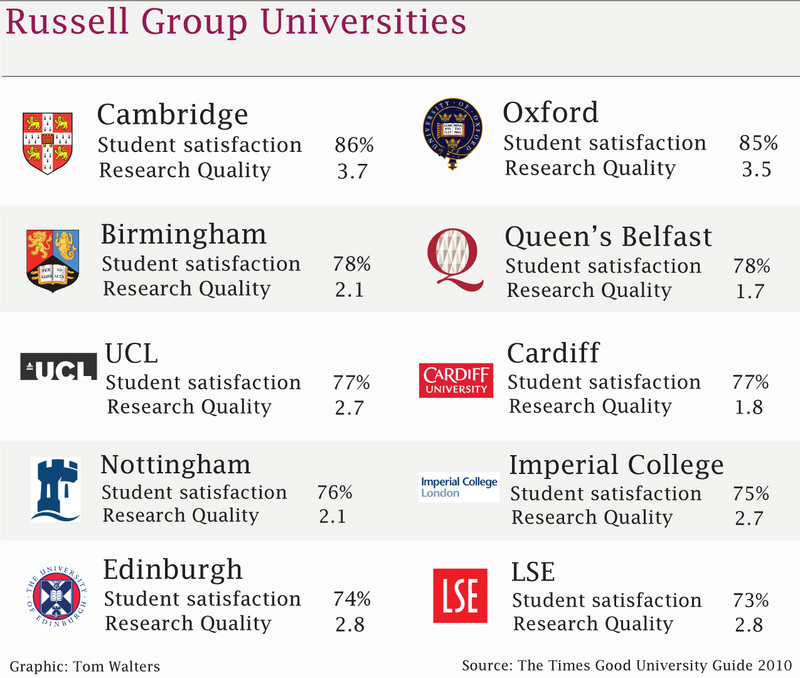 Both league tables, notwithstanding this important difference, paint a similar picture of the comparative standard of British higher education and 15 of the 20 Russell group universities are placed in the top 30 by both measures. It thus seems that the quality of academic research has very little impact on the overall 'quality' of a university, at least when it comes to the more prominent institutions. And ultimately that's what's important, right?